Equine welfare and the global monitoring of horse diseases are critical areas of concern in the horse world. But 35 years ago, when Irish veterinarian Alex Atock began his first job in regulatory veterinary medicine as a racing official, he would not have guessed that one day his lifelong affection for horses would impact how horse sports are conducted worldwide, and that his stalwart advocacy for their welfare would improve their treatment near and far. Atock’s professional memoir, My Friend the Horse, is published at a time when horse sports and racing are under both public and internal pressure to protect horses, while making sports more accessible or spectator-friendly. Many matters related to medication and welfare of horses remain to be resolved, and Atock’s insight into how some current issues began or were addressed in the past is important for the record of sport. This charmingly-offhanded account of equestrian sport history through the eyes of an advocacy-minded veterinarian probably understates the impact of decisions made and actions taken on his watch, such as the FEI’s inauguration of horse inspections at the Moscow Olympics in 1980, followed by inspections at the World Jumping Championship in Dublin in 1982. The resulting furor turned many against the FEI and Alex Atock. Fast forward to today, when mandatory horse inspections are popular with spectators, and are even spectacles of fashion on the eventing scene. 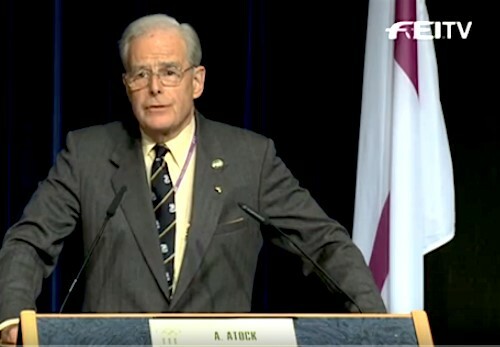 Alex Atock assisted the FEI in facing problems like “rollkur” in dressage, cross-country jumping injury and death in eventing, and over-strenuous travel and competition schedules for showjumpers. His book voices his personal concerns about endurance in the Middle East, and lists some of the paradoxes facing the regulation of that sport. A sample chapter and book front matter are available from the publisher here. HOW TO ORDER: “My Friend the Horse” is available in the UK at Foyle’s, Waterstones, Blackwell’s, and WH Smith booksellers or via amazon.co.uk; from adlibris.com or bokus.com in Sweden; via booktopia.com.au or betterread.com.au in Australia; and through Amazon.com or barnesandnoble.com in the United States. Contact the publisher at marketing@austinmacauley.com or call (UK) +44 (0) 207 038 8212. Email the author at aatock@atock.co.uk.